We are a new Grandfather Clock Dealer and are not setup for repair, but occasionally we do have calls from grandfather clock owners who have recently moved their clocks or received one from a family member and during the move the grandfather clock pendulum hanger, crutch or something moved out of place. Sometimes the suspension spring on the grandfather clock would come out and they could not figure out how to place it back on the grandfather clock. Sometimes a picture is worth a thousand words. This movement diagram of the grandfather clock below is for a cable driven grandfather clock, but should also explain how the pendulum hanger is setup on a chain driven grandfather clock. Grandfather Clock movement and pendulum diagram. We hope this will define the different parts of the grandfather clock movement and how their positions so they may work together. 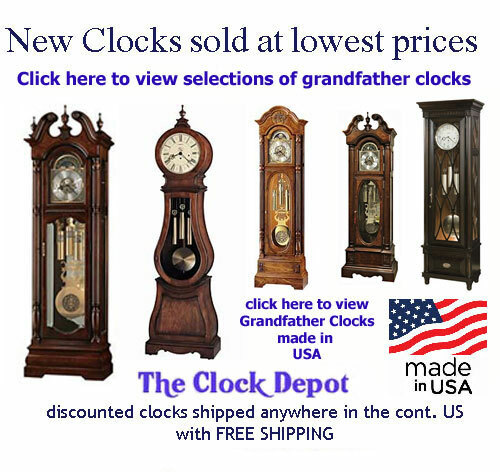 Should you wish to consider a new grandfather clock, view our selections of grandfather clocks including Howard Miller Grandfather Clocks on our product pages.